This article was written on 23 Sep 2018, and is filled under New Ecologies, Science / Technology, Theory, Urbanities. Turbid. Latin turbidus confused, turbid, from turba, confusion, crowd, probably from Greek tyrbē, confusion. Measuring turbidity, defined as the cloudiness or haziness of a liquid, is relatively straightforward. 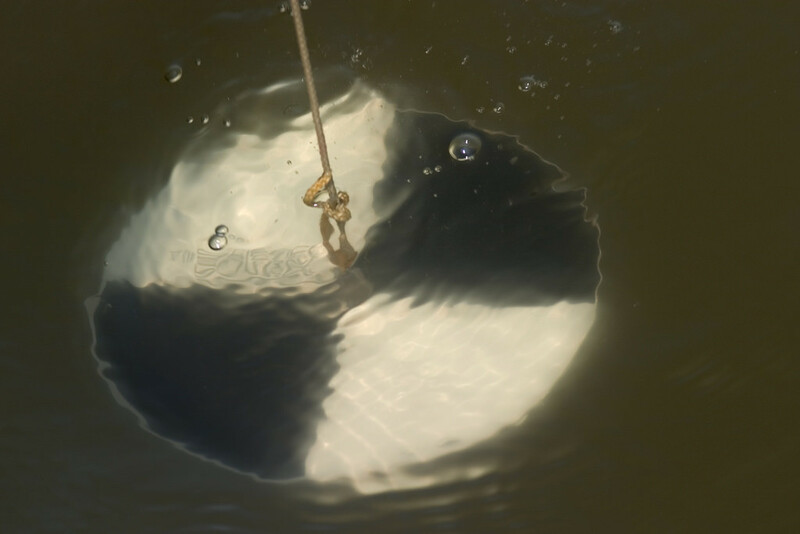 Submerge a Secchi disk in a body of water; the depth at which it can no longer be seen yields the Secchi depth value. Additionally, to determine light attenuation, divide this number (in meters) by 1.7 to yield the extinction coefficient (k) of the sample. Though the classification of turbidity is straightforward, classifications systems themselves become turbid, troubled, confounded. 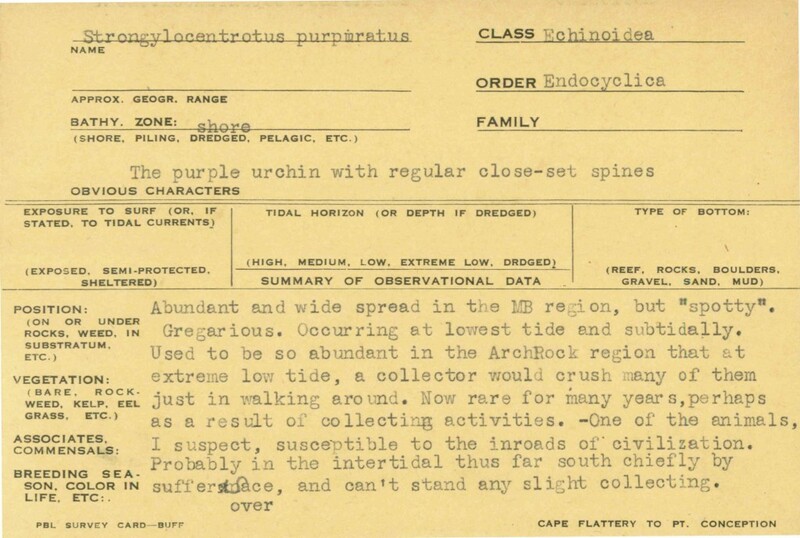 Such is the case of Ed “Doc” Ricketts’ unwritten handbook of the marine invertebrates of San Francisco Bay, The Bay Book, which exists only as a ten-page proposal in the Department of Special Collections and University Archives at Stanford University. 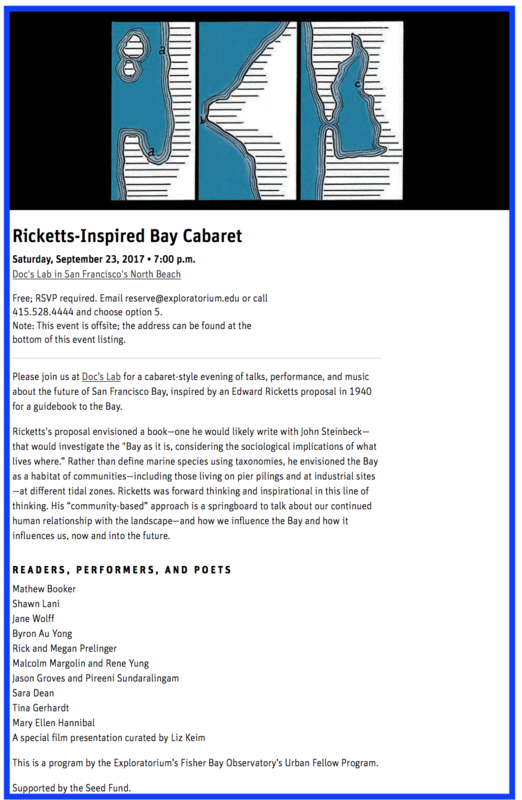 Proposing to investigate “the Bay as it is, considering the sociological implications of what lives where,” The Bay Book promised to take a novel look at the intertidal zone by organizing the space sociologically rather than taxonomically, by habitat rather than by phylum. Just shy of one year ago, some 77 years after The Bay Book was proposed, I took part in a remarkable cross-disciplinary symposium inspired both by Ricketts’ unfinished work troubling taxonomies and the multiple turbidities of San Francisco Bay. There was a talk by marine biologist John Pearse, a screening of Steve and Mary Albert’s Ricketts documentary “The Great Tidepool,” a concert of sea shanties by The Fishwives Trio, a boat tour aboard the Derek M. Baylis of the Richmond shoreline, which looked at Indigenous and settler histories of the bay and shore, and a Ricketts-inspired Bay Cabaret at the very site of Ricketts’ former salon in North Beach. In 1939, one year before he proposed The Bay Book, Ricketts was able to publish Between Pacific Tides, a guidebook to the intertidal zone, whose taxonomic disarray was met with extreme skepticism from the establishment and was only published by Stanford University Press after many interventions by Ricketts’ advocates, including John Steinbeck. But its popularity was unmatched by any intertidal guidebook of its time, and it has inspired generations of marine enthusiasts. And behind all of these insights into marine life—and into the ideal form of documentation for the non-specialist—was Ricketts’ attempts to reorganize and reclassify the inter-tidal zone by habitat, beginning with his survey cards. Filmmakers Steve and Mary Albert discuss Ricketts’ elaborate and diagram Rickett’s scientific system here. Disturb. Middle English disturben, destourben, from Anglo-French & Latin; Anglo-French destorber, from Latin disturbare, from dis- + turbare, to throw into disorder, from turba, disorder. A different form of turbidity emerges a few steps inland. 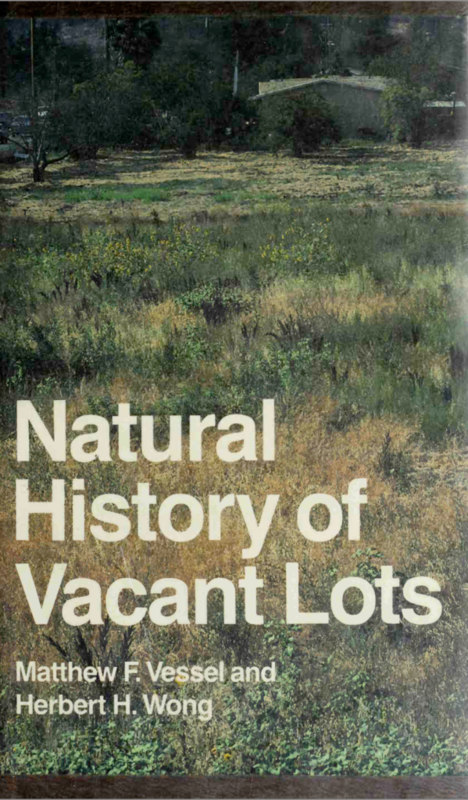 Vessel and Wong’s Natural History of Vacant Lots, which marked the 50th volume of the California Natural History Guide series at UC Press, offers a guide to plants and animals in disturbed urban sites in California and in particularly the East Bay area. 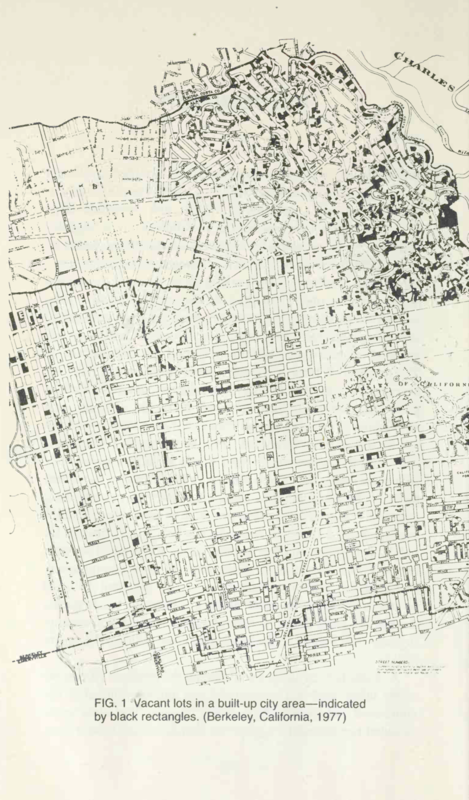 As of the time of publication in 1987 a federal study had found that up to twenty percent of urban land was “uncommitted” open space: surplus military property, abandoned land, derelict property adjacent to waterfronts, and waysides and roadsides including building frontages, edges of cemeteries, playgrounds, and parking areas. Vessel and Wong show that these disturbed sites, particularly so-called vacant lots, form a vibrant ecosystem and that their accessibility for most urban and suburban dwellers makes them of special interest: “this availability makes these sites excellent places to learn of the interrelationship of man with his environment and to gain an appreciation of ecosystems.” Though no mention is made of Ricketts in this volume, their “sociological” approach (in Ricketts’ sense: “the relation of given organisms and societies of organisms to other nearby organisms and societies, and in the relations of this complex to the almost equal complexity of the physical environment”) and their focus on habit over taxonomic orders very much follows the kind of study pioneered by Ricketts. Their guide takes measure of a biogeographical turbidity characteristic not only of vacant lots but potentially any site, visibly disturbed or otherwise: communities of aliens, of escaped cultivated and ornamental plants distributed via impurities in seed packs, ballast from boats and sweepings from freight cars, packing materials, wind water, and animals. Trouble. Middle English, from Anglo-French trubler, from Vulgar Latin *turbulare, from *turbulus, agitated, alteration of Latin turbulentus. Our task is to make trouble, to stir up potent response to devastating events, as well as to settle troubled waters and rebuild quiet places […]In fact, staying with the trouble requires learning to be truly present, not as a vanishing pivot between awful or edenic pasts and apocalyptic or salvific futures, but as mortal critters entwined in myriad unfinished configurations of places, times, matters, meanings. 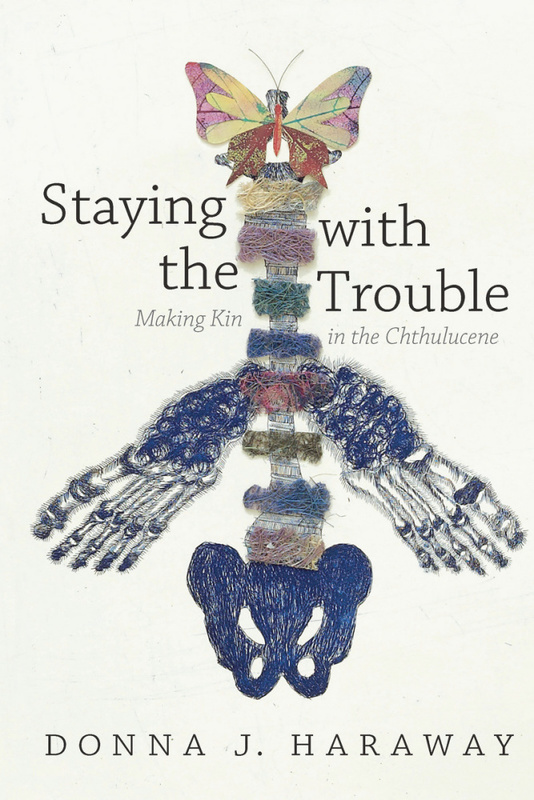 A guide book to the aftermath of the devastating anthroturbation of the planet’s surface and subsurface might not be the most potent of responses, but the minimal ethics of care involved in such observation facilitates the rebuilding of a more-than-human oikos by these nonhuman agents. Here I suspect that the postcolonial writer and poet Édouard Glissant’s “aesthetics of turbulence,” with its emphasis on the encounter of difference and the rejection of totalizing systems, might offer an impetus for the kinds of transformation that Ricketts, Vessel, Wong, and even Haraway observe but struggle to theorize. 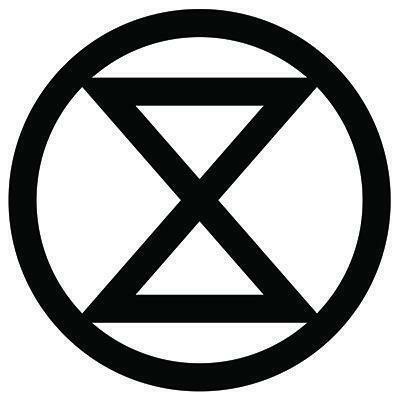 Incidentally, the freshwater Secchi disk also forms the extinction symbol: a pictogram of an hourglass within a sphere. A memento mori rather than a meter, reminding us that freshwater is running out and saltwater intrusions proceed apace. However, this misreading of the disk—perhaps yet another of the many misuses of “extinction” in settler histories— is a useful way of taking a reading of an anthroturbated planet marked by “diminished expectations” (Anna Tsing) and “reduced ecologies” (Ursula Heise). Extinction as coefficient of anthropoturbation. It involves attending to the small (like Haraway’s Pimoa cthulhu or Rickett’s Strongylocentrotus purpuratus), the apparently insignificant (like Vessel and Wong’s vacant lot), suspended sediment particles—all of which partake in a much larger commotion and the co-motion of myriad unfinished configurations and undetermined coefficients. Including those philo-turbations of language.